See our antique Sultanabad carpets now available. 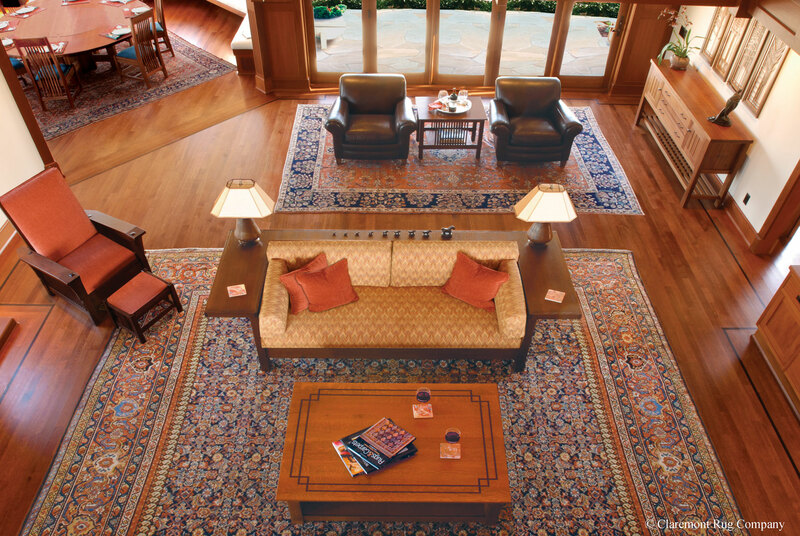 Three highly complementary late 19th-century Sultanabad carpets enhance the underlying “form follows function” theme in this newly built central California oceanside home. Like the Frank Lloyd Wright-styled architecture and Craftsman hardwood furniture, the carpets’ elegant, casual allover patterns present the elements of the natural world reduced to their essentials. Intricate, tiny flowerheads reveal their own indivisible symmetry, then expand into a broader relationship with the fluid garlands and lattices of a larger design, as if seeking the light in this airy, high-ceilinged family space. Because no superfluous ornamentation is present, each balanced line and whimsical flourish of soft, nuanced color can be enjoyed comfortably and without pretense–nothing distracts from the natural materials and supreme workmanship displayed. The best 19th century carpets often have this effect on an open floor plan, bringing together connected spaces, warm woods and fabrics and natural light into a cheerful, inviting grand space designed for living. Though the artistic heritage of each piece is well over a century old, the assemblage is fresh, contemporary and timeless.